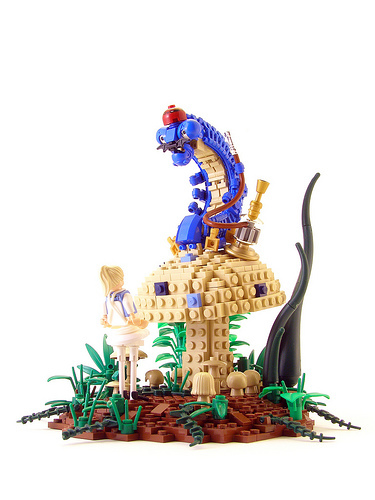 This vignette by Tyler Clites (Legohaulic) is just too beautiful and surreal to pass up. When I saw this on Brickshelf last night, I was hoping that y’all would see it. If you hadn’t I would have pointed you to it. It is an incredible vignette! I love this, the varied smaller mushrooms are great and I love how the large mushroom slants. That’s really cool. Alice was done really well. At first she looks like some toy doll, but that’s all Lego. This is a work of art. Really fantastic (And inventive) part usage!